The latest rendition of the Furuno NavNet line of marine electronics received a ton of attention at its unveiling at the Miami International Boat Show. With the new NavNet TZtouch, Furuno offers its customers a touch screen system with pinch-to-zoom capability, two-finger course rotation and other multi- and single-touch gestures. Taps, pinches and swipes are instantly transformed into useful actions and commands. From the standard drag and drop to custom multi-touch gestures that you create, this interface is so easy to understand and use. Furuno also incorporated its RotoKey rotary knob, which allows you to make adjustments, such as range and gain, or make menu selections, using either the touch screen or the RotoKey. The brains of the NavNet TZtouch system are based in its Multi-Function Display (MFD) units that feature high-performance, Intel Sandy Bridge Dual-Core processors. You can choose from a 9-inch WVGA or 14.1-inch WXGA multi-touch display. From there, you can add a variety of components to round out the package. You can also create or connect to an existing WiFi network with the TZtouch to access tablet and smartphone apps, as well as the free NavCenter Weather Forecasting for up to 16 days in advance. 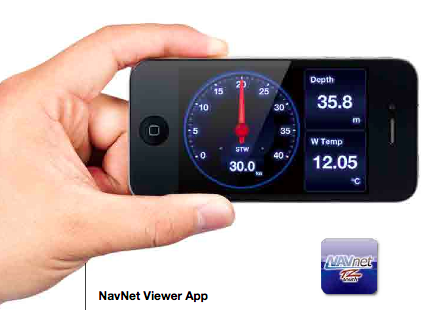 Users can also remotely view and control TZtouch with apps designed for smartphones and tablets by downloading the free NavNet Viewer App and NavNet Remote App from the Apple App Store. The Viewer App allows you to conveniently view fishing, ship, navigation, environment and engine data wirelessly on your iPhone or iPad. You can even create custom data screens with the information that is most important to you. The NavNet Remote App lets you take full control of your NavNet TZtouch by allowing you to remotely operate your TZtouch with your Apple mobile device over WiFi when connected to the network. NavNet TZtouch is supplied with free NOAA raster and vector charts, as well as bathymetric data for the entire U.S. coastline. C-Map by Jeppesen vector charts for North America that have been converted to the MapMedia format, are also provided. All above listed charts are preloaded onto a 64GB SD card that is supplied with each TZtouch MFD. You can also connect an optional USB Hard Drive or Jump Drive that is loaded with charts and hi-res satellite photos for the entire world, and the MFD will read directly from the drive, eliminating the need for multiple SD cards. All of these charts can be viewed in 2D or 3D on the fly, with seamless and instantaneous chart redraw. In addition to the charts, Furuno also offers high-resolution satellite photography that can be fused with the raster or vector charts, using their patented Satellite PhotoFusion. The satellite photos for the US are available for on from the Furuno USA website. To learn more about the new NavNet TZtouch series, visit www.FurunoUSA.com or www.NavNet.com.